Being a young kid in the late 80’s, I tried to rent every single horror movie that was within my grasps. I remember having my parents drive me not just all around town but to different CITIES just to rent rare and hard to find horror oddities. The joy that would shine on my 7 year old face was enough to pay for the gas money I guess. Still, there were hundreds that slipped through the cracks (damn you Wherehouse Video!). Movies that I didn’t even know existed before the wonderful world of the internet. Over the past decade, I have compiled a book of the horror movies that I have yet to see. How many horror movies are on that list? 847. No, that is not an exaggeration. Nonetheless, before Thursday, that number was 848 as I sat down to cross another one off the list. 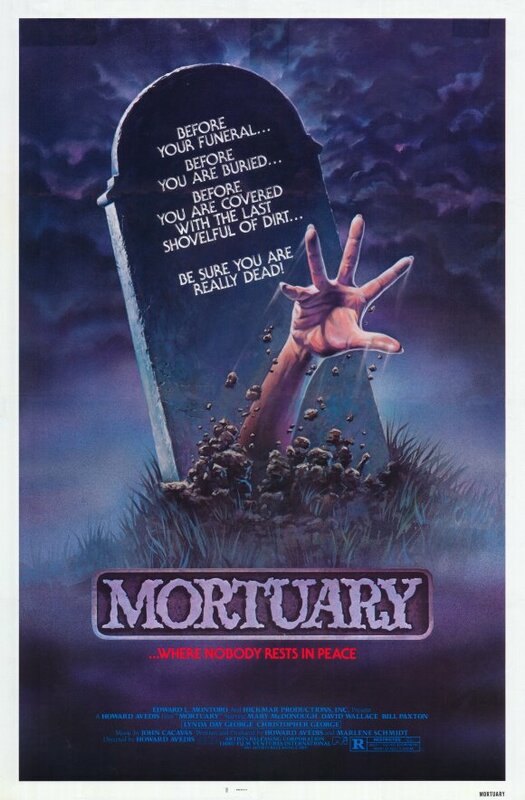 Courtesy of Katarina’s Nightmare Theater, we have the 1983 slasher “Mortuary” starring a very young Bill Paxton, a lot of corpses, and one hell of a surprise ending. How does the film hold up 29 years later? Let’s cut this baby up! “Mortuary” begins with a flashback, a middle aged man is playing out by his pool when he becomes the tragic victim of a “drowning” accident. Flash forward a bit to “present” time and we meet Christie Parson (a bland but not unlikable Mary McDonaugh) who is mourning the death of her father (the man from the opening scene). Her mother has convinced herself it was a tragic accident, but Christie is sure it was murder. Christie suffers from nightmares in which a hooded figure, clutching an embalming trocar, pursues her. She turns detective, aided by her boyfriend (real life Ken doll David Wallace) to find out the truth. Her sleuthing draws her to a local mortuary, whose owner, Hank Andrews (Christopher George), together with his secretly demented offspring, Paul, is guarding an odious secret. As if things couldn’t be worse for young Christie, she is pursued by the creepy mortician’s assistant Paul Andrews (a delightfully creepy Bill Paxton). “Mortuary” is the kind of slasher that was prominent in the early 80’s. It looks great, the acting is all around fairly solid, and the production values are a step above just about any direct to dvd horror movie of today. The problem? It doesn’t make a whole lot of sense and the second act is dreadfully boring. There are countless red herrings but they don’t add up to much because it is obvious from the first time we see the killer who it is. Why is it obvious? Because the killer is wearing makeup!!! Sorry, regular makeup can only cover so much and it is far too easy to tell who it is the second you see him or her. In the final act all hell breaks loose with one of the best “corpse parties” that I have seen in a while. The sting in the tail ending is nicely choreographed to give the audience one last little jump. It’s fun, it’s watchable, it’s forgettable.